The Andy Borland Gymnasium features a full size basketball court, and four half-court hoops and is home to local recreation sports teams and several schools. 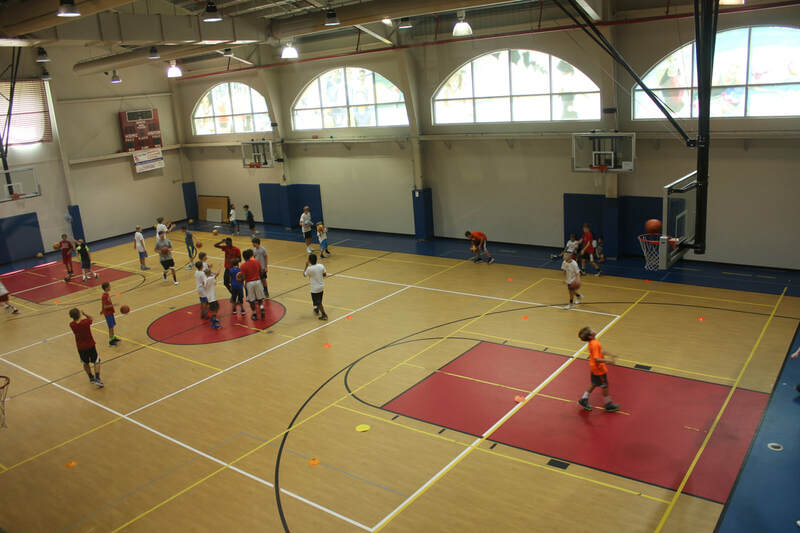 The gymnasium can be set up for three pickleball courts, volleyball, gymnastics, boot camp training, basketball and many other activities! It's also perfect for community events, fundraisers, large group trainings, vendor events, sports practice and camps, team dinners and more. You might have joined us for our Spaghetti Dinner right in the Andy Borland Gym in years past! It has multi-use flooring appropriate for activities of all kinds beyond sporting use. It is located on the lower level of the building at the foot of the stairs and is accessible from our elevator or the stairs. Restrooms and a water fountain are located nearby. Tables and chairs are included in your rental based on availability. To inquire about availability, schedule a visit, or book the room, please reach us today by either phone or email.